Israeli authorities demolished a Palestinian-owned home, while injuring two residents protesting the demolition, in the northern Israeli town of Sakhnin, on Monday. Local sources told Ma’an News Agency that Israeli authorities assaulted the residents of Sakhnin, who refused to allow the demolition of the home to take place. Sources added that the assault caused serious injuries in the chest to a 28-year-old Palestinian man, while a 60-year-old Palestinian woman was injured in her upper body. Sources also mentioned that the two injured were immediately transferred to the Rambam Medical Center, in Haifa, and, due to their medical condition, they were placed in intensive care. 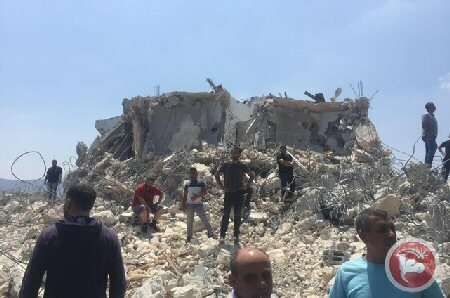 The Municipality of Sakhnin released an official statement in which it condemned the demolition of the Palestinian-owned home by Israeli authorities in Sakhnin, on Monday. The controversial “Nationality Law” passed through legislation last week. The law enshrines the status of the State of Israel as the nation state of the Jewish people, including legally preserving Israel’s “democratic” character, its state symbols (national anthem, flag, icon), Jerusalem as the capital of Israel, Hebrew as the official language and the right of return for Diaspora Jewry. Ghanaim explained that, instead of seeking to solve the housing crisis in the Arab communities, Israel is trying to speed up the process of expanding illegal Israeli settlements, increasing the suffering of Palestinian residents. He added that the Municipality of Sakhnin attempted to find a legal solution by taking all all possible steps to prevent the demolition of the Palestinian home, including contacting the office of the Israeli President. Ghanaim went on to mention that all attempts failed due to the newly passed law, which is a racist policy targeted towards the Palestinian minority, making it difficult to take initiative in such cases.